Did you know that an estimated 95% of our population is deficient in Iodine? Do you suffer from lack of energy, headaches, irritability, muscle cramps, hair loss, brittle nails, cold hands and feet or muscle weakness? These are all symptoms of Hypothyroidism associated with low levels of Iodine. You may not be aware, but 100 years ago Iodine was considered the “Universal Medicine”. Unfortunately, one bad study in the late 1940’s denounced Iodine and the entire medical community switched to anti-biotics (and we know how well that has turned out). Now researchers are beginning to see the many benefits Iodine provides the body. Iodine is utilized by every cell in the human body. Our white blood cells cannot effectively guard against infection without adequate amounts of Iodine. The absence of Iodine in our bodies not only is detrimental to our thyroid, but emerging research suggests that low Iodine levels actually can promote cancer, lead to ADD in children due to lack of Iodine in pregnancy and is essential to IQ development for nursing children. According to medical doctors researching Iodine deficiencies, 12.5 to 150 mg. of Iodine per day are required to normalize Iodine levels in the body. Our Iodine (with L-Tyrosine for thyroid health) contains 30 mg. per server. Higher intake of Iodine in Japan and Iceland have been positively correlated with dramatically reduced incidences of breast cancer. Conversely, the Great Lakes Basin in the U.S. has the lowest Iodine levels and one of the highest breast cancer rates. Thyroid problems have been increasing at epidemic rates over the last 30 years.Hypothyroidism affects from 13 million to 45 million Americans. Another 10-15 million Americans are affected with an autoimmune thyroid disorder. 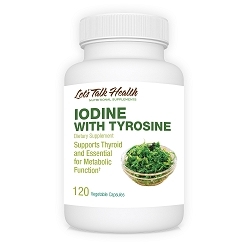 While most supplements contain just iodine, we added 400mg of L-tyrosine, which is a building block for the thyroid hormone, which controls our body’s metabolic rate and energy level. The most common symptoms of an under-active thyroid are fatigue and weight gain. Giving the body a daily supply of Iodine and L-tyrosine will promote optimal thyroid function, which will improve energy and promote weight loss as well. If you are looking to normalize your Iodine levels, start for approximately one month taking 4 a day of Iodine with L-Tyrosine a day (two in the morning and two in the evening). After a “loading” period of one month, you can scale it back to one or two capsules a day according to your specific needs. As always, consult your healthcare practitioner as we all have different needs. One thing is for sure, most of us are Iodine deficient and we don’t know it. …Thyroid is underactive, taking Armour /45 mg a day, do I still need Idoine?! Hi Eva, From a nutritional perspective — since you continue to have symptoms aligned with low iodine levels — it would certainly be worth a try to supplement with a iodine/tyrosine supplement. Please note that the views shared in this communication are the views of the writer and are not necessarily the views of Let’s Talk Health®, Inc. Please consult your physician for any medical questions you may require. These views are not to be construed as medical advice – they are nutritional advice. These opinions have not been approved by the Pharmaceutical Association, the American Medical Association, or the Food and Drug Administration. They are not intended to diagnose, treat, cure or prevent any diseases. Due to the volume of inquiries received, we regret that we may not be able to answer all of them. The content of this e-mail is off the record (including social media) unless we agree otherwise. This email message is for the sole use of the intended recipient(s) and may contain confidential information. If you are not the intended recipient, please contact the sender by reply email and destroy all copies of the original message.